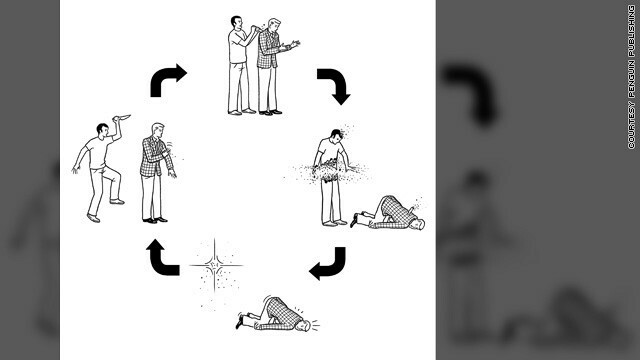 A diagram from "So You Created a Wormhole" illustrates the danger of traveling through time and killing one's own grandfather. Let's be upfront about it: Phil Hornshaw and Nick Hurwitch aren't scientists. But the friends definitely have a love of the science of time travel, which they poured into their new book, "So You Created a Wormhole: The Time Traveler's Guide to Time Travel." Hornshaw and Hurwitch have seen way too many bad time travel movies and they have the same questions as other sci-fi fanboys and fangirls: "It’s hard to walk out of a time travel movie and not go, 'How do these things sync up?'" Hornshaw told CNN Geek Out. "Phil and I are longtime geeks," Hurwitch said. "The atrocities of time travel plot devices began to stack up. We simultaneously came up with an original time travel show [still in 'drawing board phase'] and a guide book on how to do it properly." Hornshaw said that their interest in theoretical physics and astronomy came from a lifelong interest in science fiction; the pair have been friends since third grade in Novi, Michigan. "We read Michael Crichton’s 'Timeline' back in high school, and both of us were into the concepts from that book," he said. "What we wanted to do with the guide was to make it as simple as we could because it can get so expansive. We pay a lot of attention, but we don’t study up on anything more than what we’re interested in." "In the book we’re more concerned with how science affects plot, as opposed to how it affects science," Hurwitch said. CNN Geek Out: So exactly how much research was involved? Hornshaw: We did a lot of research to make sure that we weren’t totally in left field, but at the same time, we were focused on plot, so we took some liberties. Nobody should expect to get “real” science knowledge. But we wanted to be as close to the real thing as we could be, and still have a lot of fun. CNN Geek Out: So this book was borne out of frustration with time travel in pop culture, really. Hornshaw: I remember seeing “The Butterfly Effect.” It was a fun movie, but when I came out of it, all I could think of was plot holes. Hurwitch: Even the best time travel movies make pretty glaring errors. It’s not to say, “Oh, man! Everyone’s doing it wrong! How stupid!” I think subconsciously, that led to the tone – that’s why it’s absurd and fun. Hopefully people will understand, “Oh, that’s why it’s a plot hole.” It expands the experience coming out of a time travel movie and allows you to enjoy it without hating. CNN Geek Out: What did you hope to accomplish with the book? Without using equations and convoluted examples, we use the pop culture references at our disposal to help people understand time travel and enjoy it more. Plus, if you like nerdy stuff like we do, the book is just fun. I think that’s paramount. Hornshaw: The survival guide that makes up half the book came out of other things we were inspired by and other people’s work. Crichton’s “The Lost World” involved being lost out in the woods with all these dinosaurs. That sounded like a lot of fun: What if you get lost out there? The more time we spent with it, the more we realized how much there was to draw on, and how much time travel opens up, because there are so many possibilities. The more time we spent, the more we wanted to go nuts with all these things we like. CNN Geek Out: Do you think time travel to the past would ever be possible? Hurwitch: From a realistic perspective, I’d like to think it might be possible one day. Travel to the past would be similar to how Crichton describes it in “Timeline,” and that’s getting down into the weirdness of quantum foam, and that’s more interdimensional travel. Yeah, I would say it’s possible. Why not? Hornshaw: I really geek out when things like faster-than-light neutrinos pop in a movie. I want to believe, but realistically – er, I don’t know. Stephen Hawking has probably got it right. I wish he was wrong, though! CNN Geek Out: Any examples of the best or worst time travel movies or series? Both: "Back to the Future." Hornshaw: The scene from the third act of “Back to the Future Part II,” when Marty is getting out of his own way, and interacting with the timeline from the first movie, it’s just dynamite. Even if it isn’t strictly scientific, you can’t help but just love those scenes – the idea of time travel, and how much it gets, I just love that. Hurwitch: The original “Superman: The Movie” where he reverses time by flying backwards around the world: That is the worst thing ever written or filmed. “Déjà vu” [starring Denzel Washington] was a big turning point. I enjoyed it, it’s a pretty fun movie. The time travel in it is frustrating, because in the beginning of the movie, he sees things that he later does, and when he comes across them later, he doesn’t connect the dots, or realize “I’m the one who did this stuff.” It make you facepalm a little bit. Tell us in the comments: What are the best and worst moments in pop culture time travel? Filed under: Brainiac • Fandom • Squee! I have seen an improvement in speed but, only someeimts. I have noticed that when I have a lot of tabs open(say 10 or so) then, my computer slows down dramatically. Not sure why. Wouldn't mind some insight. Hot Tub Time Machine. Great movie. Stupid time travel idea. But I laughed! The end of the 3rd season of Felicity when she goes back in time. I just have to pretend those episodes don't exist. I can't believe no one has mentioned "Timecrimes" yet. (or "Los cronocrímenes" in the original Spanish.) Totally fun film. Amazing things here. I am very satisfied to see your post. Thanks a lot and I am having a look forward to touch you. Will you please drop me a mail? What if you made a different choice in your own lifetime, rather than stopping the very thing which created you? Perhaps you go back two years ago and make a different choice of something that didn't lead to your non-existence, but a choice that you could have made differently. Would you cease to exist, if that different choice led to a different chain of events?..., but perhaps you would still exist because you haven't changed the sequence of events which made you. If that is possible, I believe that you would not change the events that have occurred to the consequences you have already encountered. And this would only change the dimension of reality at which you are currently living in. Just got the book, very funny ! looking forward to the movie (LOL). One more thing, has anyone out there ever heard or seen this time-travel movie made in the UK with Anna Faris in it ? It's not available here in the USA. It's called "Frequently Asked Questions about Time Travel" – a comedy, set with three guys and a girl from the future in a British pub. Made in 2009. Ring a bell, anyone ? "Time Travelers Never Die" by Jack McDevitt. Great book AND available on Kindle! I keep reading it over and over. Or maybe I don't. I always liked the movie Frequency. While it was not time travel it was time communication and disturbances (reshuffling) the natural course of time. Jim Caviezel is in Frequency and Deja Vu. Is he really a time traveler? Best Pop Culture Time Travel: Futurama. Fry ends up his own grandfather after "doing the nasty in the past-y"
And of course, that past nastification ends up having spectacular results that allow Fry to save the universe. That concept is from the movie "Time Rider". A man in a motorcycle race accidentally goes back in time and . . .
Also, Futurama is one of my all time favorite shows. The "best moment in pop culture time travel" would be when CNN decided to go back to 1955 and start writing actual NEWS, and force their future selves in the space-time continuum to do the same, instead of publishing hypocritical, condescending, yellow journalism. Not sure that time travel is so hard. Its more trying to find where something actually was in past time. I mean with the world spinning. And traveling around the sun, which is spinning around the galaxy, which is also moving. Folding time is the easy part. People assume that time is a strict progression of cause to effect when, actually, it's just a big ball of timey-whimey stuff. Wibbly wobbly, timey-wimey..............Allons-y! Also, the angels have the phone box. "What if we had ideas that could think for themselves? What if one day our dreams no longer needed us? When these things occur and are held to be true, the time will be upon us. The Time of Angels." Best episode of Doctor WHO.... ever ! David Tennant Rules (forever) ! Anytime on any Star Trek when they travel back in time, have a need to do something not yet invented like beam someone aboard while traveling at warp or a special kind of metal, and then proceed to type the specifications for it into a computer and then tell the individual (from the past) sitting next to them "you invented this". When could they have possibly "invented" it if it was unknown to them until Spock or whoever gave them the information to create it? I read this article 5 months ago when I traveled into the future to see what was making news. What about Kate and Leopold? Pretty big disturbing plothole there. I don't want to ruin it for anyone who hasn't seen it yet, but it's pretty gross. I also thought the time-turner in Prisoner of Azkaban was pretty cool. Sure, it's usually possible to find plot holes. When they're glaringly obvious, it's annoying. But when I'm watching a movie, I just want to be entertained. I loved Star Trek IV – The Voyage Home. Of COURSE it was silly and over the top, but how can you not crack up every time Chekov is on the street asking everyone where the "nuclear wessels" are? If you disagree – well, all I can say is double dumb-a$$ on you! Ah yes. The grandfather paradox. I guess you spawn a new timeline, no? Until they address the fact that everything is travelling very fast in space, as well as time, then any time travel concept will have this problem as a plot hole. Travel in time without traveling in space will put you inside the earth with a 2 second "jump', if not into the depth of space with a 2 minute jump (@67000 mph, and that is just around the sun and not the speed of the sun moving). BTW – Gene Wolfe's 'Book of the New Sun' &' Urth of the New Sun' is certainly one of the better treatments for time travel. How do they explain "Quantum Leap"? Not only does Sam Beckett travel back in time, but his "soul" takes the place of someone in the past while that person's "soul" takes over Sam's body in the future. easy. it's a tv show—ie. not real. I think if the time reversal scene in Superman: The Movie was explained differently it could have worked from a scientific stand point. Say that instead of reversing the rotation of the earth, he was actually traveling faster than light which would have caused him to traveling backwards in time. But that might have been a little too intellectually heady for a late 70's superhero movie. Obviously they haven't watched "Timerider: The Adventure of Lyle Swann". I remember that one ! Where Lyle is his own grandfather, right ? It's been a long while since I've seen it. I'll stick up for Superman: The Movie. It's been long established that the final world-turning-back scene has no scientific or realistic basis, but as a pure movie moment, it works incredibly well. "Worst thing ever written or filmed"? You need to see some more movies, dude. I can't watch the movie because of that moment. It was not magical to me or a lot of my friends. I think the best is Primer. What? They couldn't invent a TARDIS. That movie scares the crap out of me. I find their interpretation of the plot in Deja Vu a bit strange. From what I remember, the main character in that movie does connect the dots quite well when he sees events again after his time travel. Heck, it hardly took him any time to figure out that the "surveillance" they were doing was actually a form of time travel when the other people in the room were trying to keep him in the dark. One detail that leads me to believe I remember this movie better than they do: Morgan Freeman is not in it. Denzel Washington is the lead actor in Deja Vu. Uhhhh.... Don't the brackets "[...]" indicate something inserted for clarification by the author/editor and not a direct quote from the interviewee(s)? 11/22/63 by Stephen King is by far the best time travel pop culture piece. Somewhere in Time with Christopher Reeve ...Love the movie but can't get around the idea of the watch. Also, he freaks out and goes back to his own time when he discovers a penny in his pocket. It was there the entire time but only sent him back when he discovered it was there? One of those times I just need to say "It's only a movie" and sit back and enjoy. "Timecop". Worst time travel movie ever, and a strong contender for worst movie ever, period. I can't believe that atrocity didn't even get a mention in this article. There are so many bad ones, we'd be hard pressed to mention them all. Rest assured, Timecop is covered in the book. My favorite horrible thing about that movie (and there are many) is that these people run a time travel agency, and yet whenever anything changes and JCVD notices, everyone in the office act like he's the one being a weirdo. Shouldn't you be prepared for the inevitability of alterations to the timeline? On the plus side, Timecop means that there is a real movie that exists called Timecop. Remember "Timecop – the series" w/ T.W. King on ABC way back in the late great '90s ? But it did get one very important fact correct. Same object can't occupy the same space at the same time. When they involve children it drives me nuts. For example, BTTF Marty's parents are completely different at the end of the movie yet they "got busy" at the same exact time as in the original story line producing the same exact kids. Statistically that's not possible. Then there's Family Man which is treated like a fun holiday film, but in the end the kids that are in the film will never be, it's not possible. I have invented a time machine, but so far I can only get it to go forward at the speed of regular time. Try pointing it the other way and sitting in it backward. That's what worked for me. I've considered time travel stories to be the worst of science fiction for a very long time. It's invariably a way to inflate largely trivial or tangential stories into something "more epic." But the "What If" element is what makes the stories so intriguing. Sure the science doesn't hold up (yet), but neither do Star Trek and Star Wars (yet). "The Final Countdown" – not a great movie but enjoyable. An Nuclear Aircraft carrier inexplicably goes back in time just before Pearl Harbor and is placed in a position to defend the United States and prevent WWII. What would happen if it did? Should they interfer or not? While not exactly pop culture, my favorite time travel story is Robert Heinlein's "By His Bootstraps". Some of the stories I like (while knowing they are incorrect) are the "Star Trek – TOS" time travel stories (ex. "City on the Edge of Forever" ,"All Our Yesterdays", "Tomorrow is Yesterday".) "The Time Traveller's Wife" film had an interesting theme. "A Sound of Thunder" was much better as a short story than a motion picture. Finally, I should mention H. G. Wells' "The Time Machine". While the 2002 film had pretty good special effects, the 1960 one scared the willies out of me as a kid when the evil Morlocks appeared on screen and remains my favorite version. Time Traveller's Wife – the book was great, but I thought the movie was awful. Agreed. Loved Audrey Niffenegger's book but was very disappointed by the movie. True. I loved "By His Bootstraps"